This week, with Thor The Dark World set to smash into cinemas and create legions of new fans in just a few days, I thought 'Hey, lets have an Asgardian song to match'. Luckily Manowar not only thrash out such a ditty, by Odin's beard, they have it live and in HD as well. Will die together in the end"
Plus, they all look like extras from Beowulf. :) Couldn't ask for more. Thanks Random! Now if the song could just squeeze in a Thor vs X-O Manowar verse, the name of the band would lead into a song drowning in comic cool. 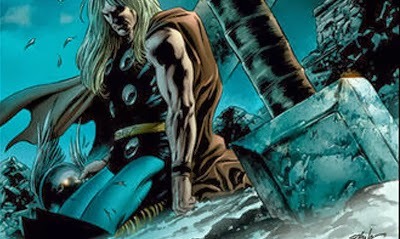 Afterall, a barbarian in a suit of armour is just as cosmic and savage as a Norse God of Thunder! How have I not already heard about this? With a name like Manowar, it just seems like a natural combination to include Thor in their song list. Hell add Conan, Kull, and any other barbarian character to that list. Speaking of Thor, I'm surprised you haven't included any Black/Death Metal from his home area of that side of the globe yet. You know Dale - I have such a mental breakdown over what genre to feature each week I've never even thought of nationality spread. If I end up in Arkham next week as a result, don't feel bad, no one will look back on this and blame you. Next week we're going rock, but not as you might think, and the week after we look at a super villain, so while I'm asking my inmates what the difference is between a joke and a riddle, and getting the Mad Hatter to ask Poison Ivy if there's a door in her garden that leads to wonderland, at least you'll have some great tunes to tune into.